Today’s Sunseeker began back in 1960 when Friars Cliff Marine was organized for the purpose of building a small plywood dinghy. By late 1970s, the company had grown into Poole Powerboats and sport cruisers. By 1980s, as the demand increased, Poole boats were evolved into Sunseeker Yachts and they were known as one of Europe’s most influential boat builders. 2018 Sunseeker 76 is a beautiful combination of style, space and performance and truly one of its kind. The interior is luxurious with satin-finish silver oak joinery and gloss accents. 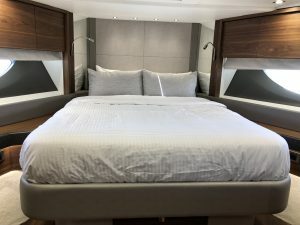 We did custom duvets and sheet sets for this Sunseeker throughout. We used our 600 thread-count Egyptian Cotton sheets in stripes. Our sheets are available in a variety of colors to choose from and are sold as a set including a fitted sheet, flat sheet and two pillowcases. Together with our custom sheets, our custom duvet covers bring the perfect amount of color and comfort to your bed. You can mix and match fabrics from our fabric collection to get the look you desire. Our custom duvets are down alternative, low to medium loft that provide comfort and warmth without the bulk. 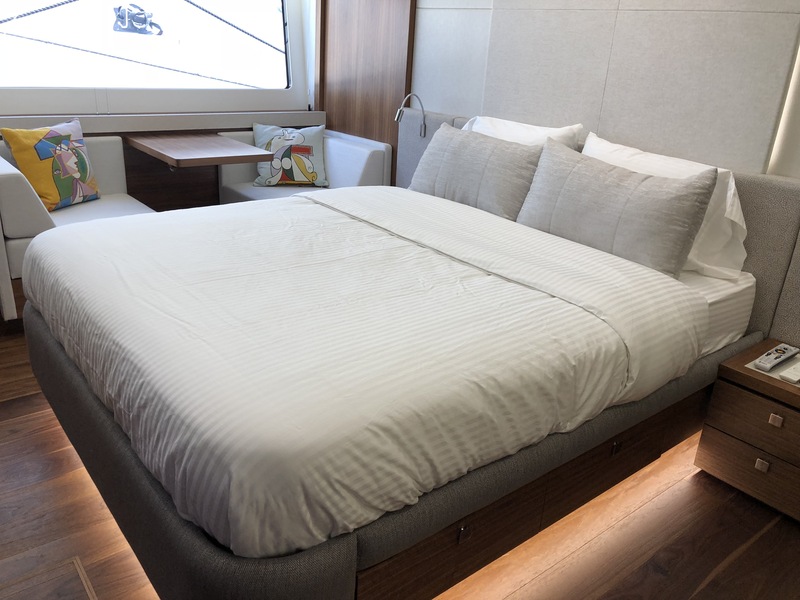 Here, the white striped duvets with white sheets and grey pillows goes incredibly well with the interior décor of the staterooms keeping it so modern and elegant. Who doesn’t love greys! It is definitely one of my favorite colors and this bed is sure my dream bed for my boat one day and so can be yours in no time. We carry a wide selection of beautiful, intricate patterned and solid fabrics and you can view them on our website. Feel free to contact us and our designers are always available to help you with your selection. Mattresses, toppers, sheets, bedspreads, quilted coverlets, duvets, blankets, throw pillows and more! We are your one stop for all your needs. We do all the work while our client rests to enjoy the final design. Our aim is to provide quality service to you while transforming your stateroom into your Dream Room!